Life is not always smooth sailing, it won’t always go the way we want. Although we always tell ourselves to live life positively and have a positive mindset, it will never be 100% positive. There is still bound to be a certain percentage of negatively. In this fast paced world, there are so many things going on in our daily life. There’s so much we want to do and so much we want to achieve but despite all these negativity and aims, we can still live life happily. These are a few ways I’ve implemented into my lifestyle for a happier me. There are bound to be things we have to do that makes us feel negative because we don’t like to do them. Among all these uninterested tasks, make time out to do what you love and look forward to doing them while you’re doing the things you don’t like. For me, I have a part time job and I hate it so much. I’ve been trying to find a new job but to no avail which is why I’ve been holding on to the current job that I don’t like. What truly managed to keep me going on with that job is looking forward to what I’m going to do after work which are all my favourite things such as reading and gaming. I’ve mentioned before that quotes are my source of motivation. It is my main source of motivation but it is also a source of comfort. Whenever I’m feeling down, I read quotes to perk myself up. Reading quotes is like having a voice in my head that encourages me, tell me that I’m capable, it’s just a bad day and not a bad life or whatever quote I’m currently reading. It’s like self encouragement but instead of me just telling myself this and that, it’s the words I read and that voice in my head telling me all those encouraging words. With all these encouragement from the quotes, I’m able get out of the wreck quickly, back to being cheerful and motivated. Don’t hold onto grudges because it doesn’t solve anything. All it does is ruin our happiness. I used to always be affected by what people think and say about me. I will get over emotional and agitated when I hear negative remarks about me but I’m glad to have change. Although I still get said negatively which is bound to happen, I’m no longer over emotional and agitated by these remarks. As much as I hate my part time job, I have to admit that has helped me in this aspect. Of course those negative remarks will still get into me and this is where reading quotes comes in. The quotes will remind me that the remarks are only the opinions of those people which may not be true about me or it may be true but that’s only for now and I’ve the capability to improve on it. I enjoy being alone at home but as much as I enjoy the comfort of home, I definitely need to go out as well. Cooping up at home for too long is unhealthy for the mind and body. Going out is actually a mood lifter so after a day or two of staying home, I will go out for a change of environment while continuing to do whatever I would do at home. I’m usually on the computer at home but when I’m out, I’ll be on my tablet which I’ll always bring out. I usually hang out at a cafe whenever I’m out because I can be on my tablet writing blog posts or playing games. 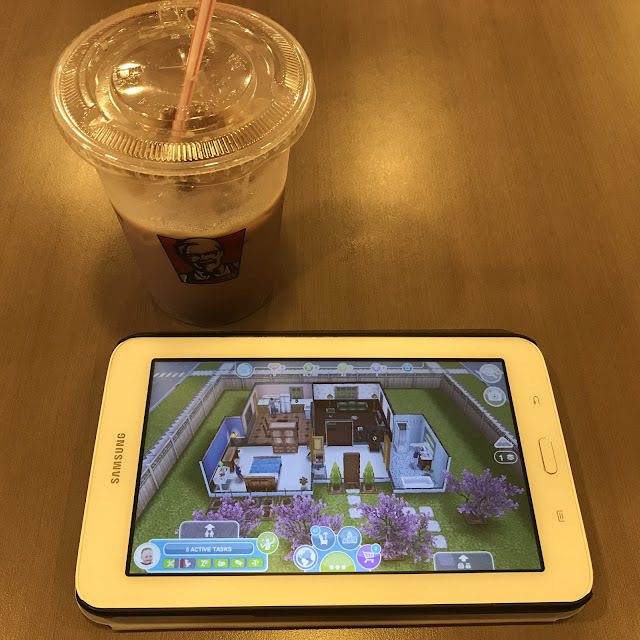 Although I usually hang out at cafes, occassionally I’ll hang out at fast food restaurants such as McDonald’s or KFC where there’s also free wifi. The food and drinks at cafes are actually quite expensive so I can’t afford to always be there. Fast food restaurants are the best alternative to stay for hours with a cheaper meal. Being happy is actually very simple and that is being contented with how life currently is. I always tell myself that a happy life is not a perfect life, it’s being contented with how my life currently is. We are always aimming for more but as we work our way to achieving more, we should be contented with what we have now. At least we’re forunate to not be living in poverty. We have a roof under our head, lots of good food to eat and proper clothes to wear. Living a joyful life is all about being aware of how we are feeling and controlling our mind to quickly get out of the negative feelings. These are only a few ways I’ve been using to get out of negativity out of so many ways to lift the mood. What do you do to live life happily?